After departing Old Dave’s Harbour, Julie and I cruised into nearby Otter Cove for a looksee. 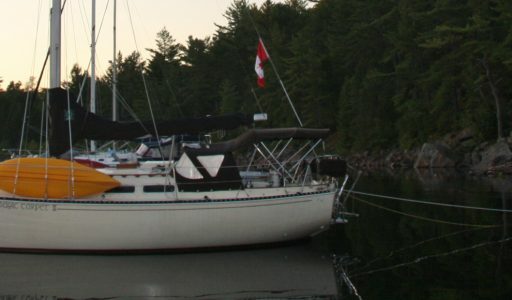 This anchorage is due north from the east end of Otter Island. A long narrow island helps block southerly winds in the bay while magnificent rocky cliffs rise steeply along the west side. Equally high but tree lined bluffs protect from northern and easterly weather. This home to loons is easily one of the most beautiful and serene bays we have seen on Lake Superior and home to loons. 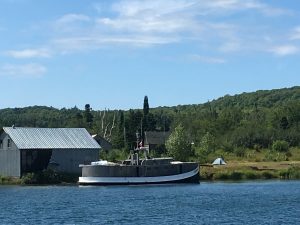 We were tempted to stay over, but decided to move on as we wanted to ensure plenty of time to visit Michipicoten Island on our way to the East Shore and ultimately back to Batchawana Bay for a final rendezvous with Steele’n Time and its intrepid crew. As we crossed out of Otter Head, the eastern entryway to Otter Cove and the channel to Old Dave’s Harbour on Otter Island, we took stock of the wind and decided to make for the west end of Michipicoten Island. Strong southerlies would have compelled us to proceed along the mainland shore before making a shorter run to the island out of Pilot’s Cove. 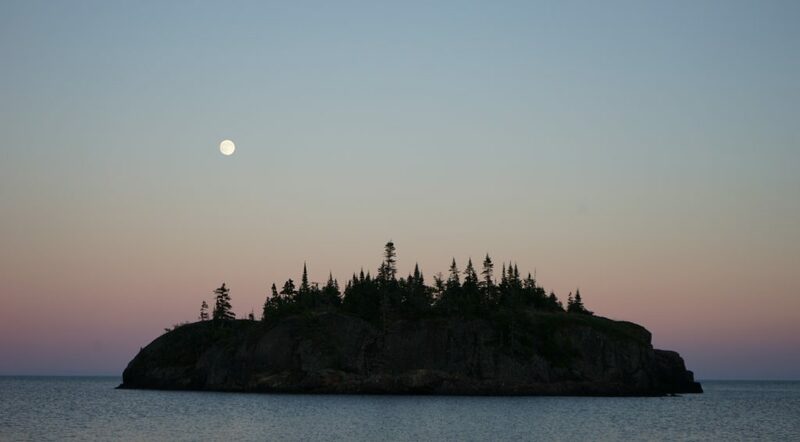 The agreeable seas and the desire to explore Michipicoten Island sealed the deal. Michipicoten Island is Lake Superior’s third largest island. It anchors the northeast corner of this great lake much as Superior’s largest island, Isle Royale, anchors the northwest corner. About 17 miles long east to west by up to 6 miles wide, this beautiful jewel is densely covered with old-growth pine forest. Its north shore lies 10 miles off mainland Canada; its east end is 30 miles from the mouth of the Michipicoten River near Wawa, Ontario. From Otter Head, the west end of the island is 30 miles. The island is renowned for its large population of woodland caribou—currently estimated at between 300 and 400 of this non-migrating strain. After being hunted out a century ago, caribou were reintroduced in 1982 when several mating pairs were transplanted from the Slate Islands in western Lake Superior. The caribou population grew steadily until a few wolves crossed to the island during the record Superior freeze a couple years ago. The wolf pack is growing and island residents report seeing fewer caribou calves. Seeking caribou was our prime motivation for going to Michipicoten. We bypassed the island last year due to mechanical delays in Wawa. 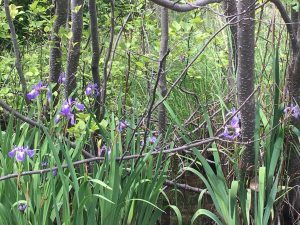 Julie was intent on seeing caribou, moose or any large animals in the wilds of Ontario, but we never spotted a single large nondomesticated ruminant all summer. This year we were not going to be thwarted. We caught our first glimpse of a couple of female caribou at the fishing station salt lick in Quebec Harbour on Michipicoten Island the previous week. We were on our way to Old Dave’s Harbour with Steele’n Time. Unfortunately, our boats scared the caribou off. The glimpse did not mollify Julie, who was thereafter pestered by Dave and his buddy, Moe, on Steele’n Time with false sightings of caribou and other imagined critters on Otter Island. 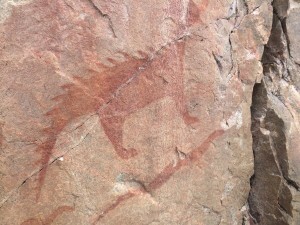 depicted on the Agawa, Ontario pictographs. Michi Peshu was said to be a giant scale-covered cat with copper horns and spikes along its back and tail. Michi Peshu, who was the bringer of storms on Superior, jealously guarded the copper found throughout the Lake Superior basin, and was particularly protective of Michipicoten. 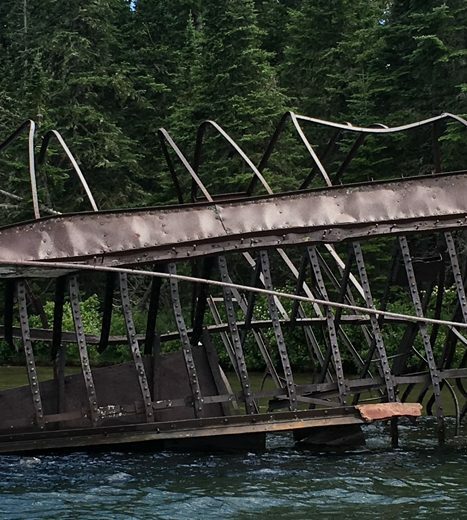 Michipicoten is now a provincial park, protected by the government of Quebec—which apparently consigned Michi Peshu to some bureaucratic file. The north shore of Quebec Harbour is dotted with a handful of seasonal cottages—“camps” in the local parlance. The camps are concentrated across from the well-marked entryway to the harbor, which includes the historic Davieaux Island lighthouse. The large harbor extends slightly west of the entry way, but a good half mile east, and affords one of the largest and best-protected anchorages at the east end of Lake Superior, if not the entire lake. An abandoned commercial fishing station sits on a point near the east end of the harbor. One or two of the small houses in the cluster of buildings are still used for shelter by fishing boat crews working near the island. It is a favored camp among kayakers who either paddle from the mainland or get ferried there from Wawa. This abandoned camp is also where the caribou routinely come to lick the salt blocks left for them. We saw plenty of caribou come and go our first night there, but to Julie’s chagrin a pod of kayakers showed up and made camp next to the salt blocks. We never saw another caribou, and we never got any photos to document the sightings. On our way to Quebec Harbour, we passed a large oceanic research vessel. 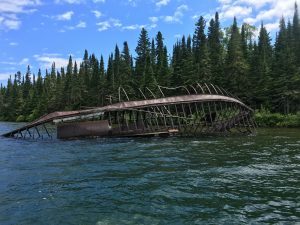 The Kiyi, out of Ashland, WI, was roving off the southwest shore of Michipicoten as we rounded the end of the island and cruised up the passage between the island and a string of shelter islands and scary rocks. On our way to Old Dave’s, Dave Steele guided us through this passage in heavy fog while Michi Peshu thrashed angrily on the other side of the rocks. 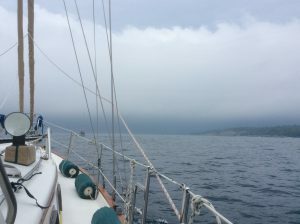 Anyway, shortly after we dropped anchor in Quebec Harbour, the Kiyi, which we presume rhymes with aye aye, steamed into the harbor and anchored across the bay from us followed by another sailboat that anchored farther to the west. The Kiyi left early the next morning then the other sailor, Molleboon, moved into our part of the bay and dropped its Bruce anchor directly upwind a short distance from our bow. We watched with some trepidation as the new neighbor’s swing from its anchor pivot would easily cross between us and our anchor. That would not normally cause alarm but for an incident during our previous visit. We had rafted up with Steele’n Time in the same spot. At dawn the next morning Julie was awakened by the loud chirping of birds. Getting up to investigate, she discovered that Dave’s Bruce anchor had not held; our aft ends were nestled against the banks of the fishing station with our rudders stuck in soft mud! According to Dave, that anchor has kept six boats safely rafted up numerous times in various locations. Indeed, just a couple days earlier we had weathered 50-60 knot winds in Batchawana Bay while rafted to Steele’n Time on its vaunted Bruce. Now I’m not prone to judge a sailor by the size of his anchor, but like Donald Trump’s tiny hands, Dave Steele’s Bruce had seemed small for the size of the boat. 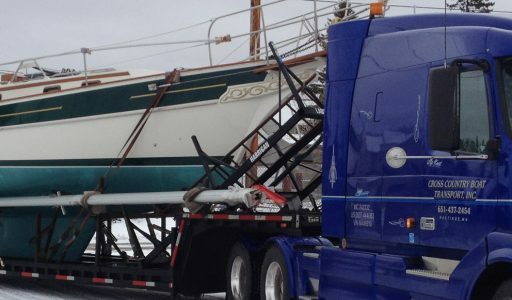 The confidence earned in that Batchawana blow evaporated when the Bruce let go in a moderate breeze while hooked in the soft mud at the bottom of Quebec Harbour. We easily motored off the bank, but my faith in the Bruce anchor in that kind of holding ground was substantially undermined. Watching Molleboon we discussed hailing her when the crew realized their proximity, raised their anchor and reset it farther away and out of the line of wind at the time. A short while later the crew of Molleboon stopped by in their dinghy to get acquainted. It turns out Dutch and Bonny have been coming to Michipicoten Island for years from their home port on Lake Michigan. They are good friends with the summer residents on the island and we have numerous mutual sailing acquaintances. Julie and I passed most of the rest of that day aboard Gaviidae cleaning and getting caught up with our logs and blogs. The next morning we explored the harbor from the dinghy, motoring and sometimes rowing up the two streams that empty into the east end. We inspected the three wrecks along the south shore of the harbor, then decided mid afternoon to head to Cozens Cove, five miles to the east. We had been told there was a rustic sauna there. Passage to Cozens Cove was quick and we rounded the rocky islet at the entrance to the small-but-beautiful harbor with hours of daylight to spare. We avoided the quickly rising rocky beach if favor of a landing near the unoccupied camp on the west shore and promptly found the sauna. There was also a handy biffy nearby. There was plenty of recently cut wood stacked next to the heater door, but I had brought my camping saw from the boat and added to the pile as the sauna began to heat up. It was an oven inside within 20 minutes and although we never got the water in the holding tank as warm as we would like, we had a great sweat and steam–then cold rinse–before shutting things down and returning to the boat for dinner just before sunset. That night we watched a full moon rise over the islet in the mouth of the cove and reveled in the peaceful solitude of that pretty little bay. What a fun description. Ah, a wilderness sauna. Heaven on earth.